When I first started running three years ago, it was Victoria Park in Hackney where I did my first circuits. Once round was enough back then, leaving me puffed out, but proud of my achievement, as I walked back to Roding Road via the newsagent. Today I returned to Victoria Park to do three circuits and a little bit more, as a competitor in the Barts and The London 10k. It was a glorious day, with a varied field of runners. As usual, I finished in the middle of the pack, with a time around 55 minutes. Not as good as the Bupa run a couple of weeks ago, but still ok.
Victoria Park is one of London’s hidden gems. 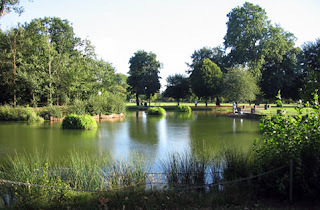 It was London’s first public park, opened in 1845. For many East End children since then it will have been the only patch of green they will have seen – and it is a wonderful one. It has a lake, originally planned as a bathing pond; a highly ornate drinking fountain which looks like a mini Albert Memorial; cricket nets, football pitches and tennis courts. It even has an adventure playground and skateboard park, hidden in trees in the centre of its 218 acres. I ran past them all today, three times; they were all in use – except the bathing pond. Swimming was stopped there in the 1930s. Anyway, a lovely run on a beautiful morning. Just the right sort of event to kick off my training for the Berlin Marathon later in the year.